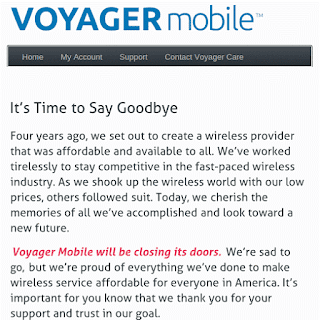 Voyager Mobile, a four year old Sprint prepaid MVNO, has announced that it is ceasing operations Sept. 9, 2015 at 11 PM EST. Customers should port their number to another carrier before Sept 9. Numbers not ported before that date will be lost forever. To port a phone number, give your new mobile operator your Voyager account name, billing address, account number, and account PIN. Call Voyager at 1-855-33-VOYAGER to get or verify this information. 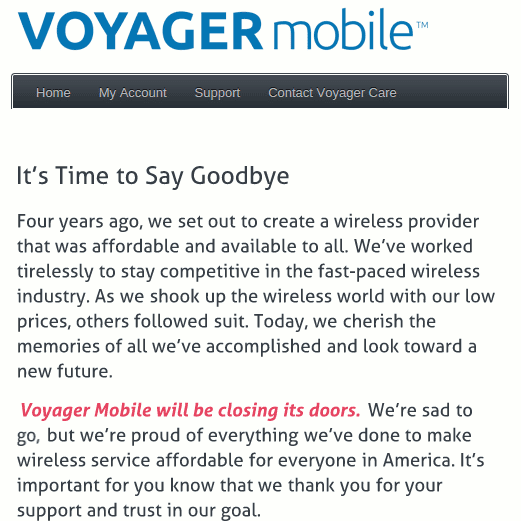 Unlike several other MVNOs that went out of business in the last couple of years with little warning, Voyager seems to be doing as much as possible to treat its customers fairly. According to a Support page on the Voyager site, customers can request a refund for any days of service lost when they port out by calling 1-855-33-VOYAGER. Customers can also purchase a partial month to keep their line active until their port is complete by calling the same number. It you want to keep using your Voyager phone with your new provider you need to switch another Sprint MVNO. See Sprint and Sprint MVNO Prepaid Plans Compared for a comprehensive list. I am almost sad for them, there is so much competition that you really have to stand out in this market to get any decent market share, at least they seem to be doing all they can for their customers while existing the market. Indeed - I can't remember hearing of them before. I love that the competition is driving down prices relentlessly, but some of the wreckage left in the wake might not be pretty. I just hope that when things are shaken out there's still enough competition to keep prices in check. The beauty of the FREE MARKET. Describing an industry with unbelievable barriers to entry and startup costs, crippling FCC licensure and regulations on operators and handset makers alike, recent "virtual nationalization" in the form of reclassification as common carrier, and now first party loss-leader pricing of "discount retail" brands completely destroying the business model of half-decade old wholesale partners as a triumph of the free market is either brilliant irony or woeful ignorance. How is this a good thing? Competition drives prices downward. Unless they were crooked and cheating people out of their hard earned money, I cannot see how the failure of Voyager is even remotely a good thing. I think Voyager failed because of their high plan prices, high and poorly disclosed taxes and fees, little or no marketing, and buggy, hard to use website. The Sprint FEC fiasco didn't help either. Yeah. This is the first time I've ever heard of it. Free market? This is chaos. I think it was irony, and I decry some of the non-free features (government intrusion to force companies to degrade service) that "Anonymous August 12, 2015 at 6:03 AM" describes. But I completely think that Net Neutrality is necessary, and does not hinder the free market whatsoever. Net Neutrality makes the market as free as, say, competing shops selling bags of ice. None of the shops anywhere punishes you for using the ice to cool beer instead of freshly caught fish: it's none of their business. Just as the legal use of the data you buy is none of the carrier's business as well. Not having Net Neutrality for carriers means the same as allowing gas stations that sell ice bags charge you more for the ice depending on what you do with it when you got home. Net Neutrality is nothing like "virtual nationalization" at all. In nationalization, the rulers steal massive amounts of property from the people, for the rulers' own use. With net neutrality/common carrier, the rights of the people to do what they want with what they purchased (data over a carrier) are protected. Nothing is stolen, most certainly not from the carrier: the customers have paid for this data. "How is this a good thing? Competition drives prices downward"
The second sentence answers the first. Other than Ring Plus and they are not for everyone, I don't see any of the Sprint MVNOs offering anything that is relatively competitive. Even at the higher priced UT/UT plans Sprint Sub Boost seems to be the only game in town.